Join me in giving a big welcome to literary agent Joanna Volpe, who's here today to share a few of the things that get her excited about a submission. We hear the "don'ts" so often, it's nice to hear a few "dos." 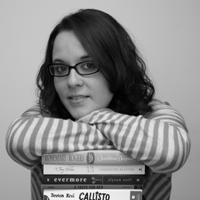 Joanna is a literary agent and the president of New Leaf Literary & Media. She represents all brands of fiction, from picture books to adult. She has an affinity for stories that have a darker, grittier element to them, whether they be horror, drama or comedy. Her recent publications include Henny by Elizabeth Rose Stanton, The Sharpest Blade by Sandy Williams, Erased by Jennifer Rush, The Lost Planet by Rachel Searles, Between the Devil and the Deep Blue Sea by April Tucholke, The End Games by T. Michael Martin, Siege and Storm by Leigh Bardugo, I’ll Be Seeing You by Loretta Nyhan, and A Darkness Strange & Lovely by Susan Dennard. In addition to her recent books, Joanna has a project by client Veronica Roth just hit the silver screen this past March: Divergent (Summit/Lionsgate) starring Shailene Woodley, Theo James, Kate Winslet and Ashley Judd. When Joanna is not reading (which is almost never), she can be found either cooking, playing video games, or hanging out with her husband and their chihuahua Tough Guy in their NYC apartment. You can listen to her random ramblings on twitter, facebook or instagram, and check out her latest deals on Publishers Marketplace. As far as agent articles and blog posts go, I’m sure you’ve heard of a TON of things to NOT do when querying: "Don't address the query with 'To Whom It May Concern.'" Never use the phrases "Tolkienesque" or "Dan Brownian" to describe your work. Don’t open the story with a description of the weather. Avoid info-dumping descriptions or backstory. The list goes on. But I rarely see agents talk about the things that get them excited for a manuscript they’re reading. Well, I will give that a go right now. Please note: this business is subjective, and that’s a very good thing. So the things that get me excited might not get another agent as jazzed. Everyone has different reading tastes, and that’s what makes this industry so lovely. Variety, people! 1. A killer first line. This one IS mandatory for me. In fact, some kind of conflict is mandatory for all fiction, but for me—the juicier and more layered, the better. I love when an author can introduce conflict, then more of it, and even more on top. I love the drama of it, but not if it’s melodramatic (so don’t confuse the two). It can be quiet drama unfolding in slow suspense like The Thirteenth Tale by Diane Setterfield or Salem’s Lot by Stephen King (can you tell I love this book?) or more recently All the Truth that’s in Me by by Julie Berry. But I also like in-your-face, super high stakes, action-oriented conflict, like in The Hunger Games by Suzanne Collins or Altered by Jennifer Rush or False Memory by Dan Krokos. Whatever the conflict, give me more! Leigh Bardugo’s entire Grisha trilogy (Shadow and Bone; Siege and Storm; and the upcoming Ruin and Rising). She is the only author I’ve ever known to successfully create three viable leading men (it’s amazing how she makes these relationships work), but all of them still take the backdrop compared to Alina’s relationship with Genya and The Darkling’s relationship with Baghra. I won’t give any spoilers, but people!! You must read to know how good this is. And there you have it—the top three things that really light the fire for me when reading a manuscript or book. What are yours? Excellent advice. I really love it when characters clash. For me, it's that kind of tension that pulls me in the most. Thank you for the information about the tension and the first lines. Examples help authors. I love reading books and this article help alot. 1) As quickly as humanly possible: a character I can relate to, someone to be my avatar in the story. 2) A voice - so that I know immediately the storyteller has control and is going to take me on a good ride. 3) A promise: something that makes me think the journey will be worth my time. This promise will be a gestalt of the cover, the description, cover copy, maybe a prologue - plus the first page, first scene, first chapter. 4) Basic competence with writing, formatting, dialogue, visual appeal. I can usually tell within a few pages if the book is something I want to buy - or finish.